A doctor claims that he developed a successful drug to combat Ebola with the U.S. Army at Ft. Detrick Maryland but that the research was inexplicably shut down two weeks before the first outbreak of the virus in West Africa. In the fall of 2013, Davis’ company began collaborating with the US Army at their Level 4 bioweapons facility at Ft. Detrick, Maryland to develop the drug, with astounding success. “Everyone was very excited about these results since there has never been a broad-spectrum anti-viral drug that killed so many different viruses without affecting normal (uninfected) cells in this way,” writes Davis. However, after the Army initially indicated to Davis and his team that they were ready to move ahead quickly with further testing, communication completely ceased. 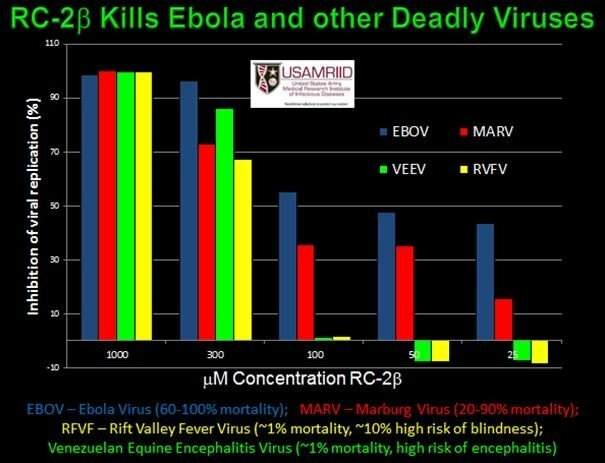 Army research data shows effectiveness of RC-2Beta in fighting the Ebola virus. “Our once close communications and cordial relationship with the Ft. Detrick team went totally and inexplicably silent. Our phone calls went unanswered and emails unreturned,” writes Davis, adding he was “stunned” when the first reports of Ebola emerged in Africa just two weeks later. The doctor also desperately contacted mainstream media outlets in an effort to get the story out, including CNN, ABC, MSNBC, CBS, the New York Times, the Washington Post, the LA Times and others. After making initial contact and agreeing to provide documents, Davis was subsequently stonewalled and every outlet dropped the story. Davis then turned to Florida Congressman David Jolly in an effort to reopen lines of communication with Ft. Detrick, a process that is ongoing. 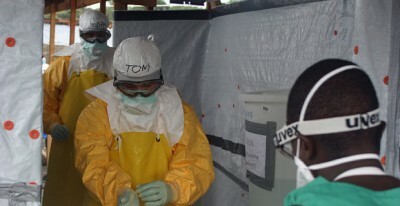 While health authorities and the media aggressively promoted ZMapp and other less successful drugs and vaccines to fight Ebola, Davis set about anxiously contacting the World Health Organization, which in June announced that experimental treatments for Ebola would be fast tracked. The doctor also slammed the Obama administration’s response to the Ebola outbreak. Davis’ conclusion on the government’s handling of the Ebola crisis and the fact that a potentially successful cure for the virus was shut down by Ft. Detrick immediately before the outbreak in West Africa left him to draw a sobering conclusion. “I am left to conclude that America’s leadership is either guilty of gross misconduct, dereliction of duty, criminal negligence or worse – treason,” writes Davis, warning that the “crisis will undoubtedly spiral out of control” if the advice of incompetent public health authorities, the government and the media continues to be followed unquestionably. Davis boasts an impressive Curriculum Vitae, having authored over 400 patents and trademarks while also being awarded commendations from the Chief of Naval Operations.